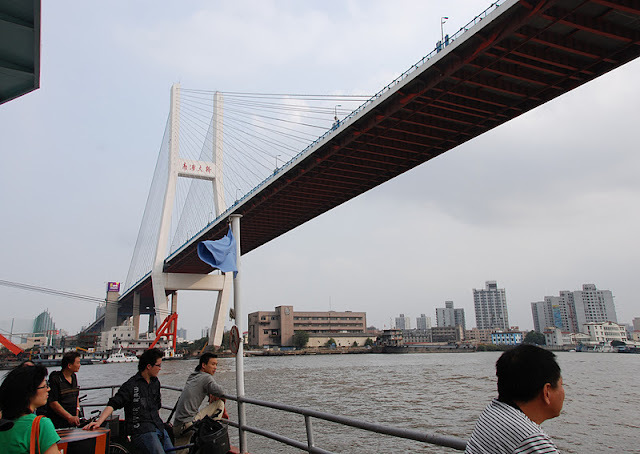 The Nanpu Bridge was the first bridge to cross the Huangpu River in Shanghai. It's a cable-stayed bridge with a main span length of 423 m (1400 ft). It was designed by the Shanghai Municipal Engineering Design with technical review from Buckland and Taylor and completed in 1991. Some rivers are the right width for arch bridges (like the Seine), some need a suspension bridge like the Hudson, and some are just right for a cable-stayed bridge like the Huangpu. Instead of elongated A-shaped towers like on the Yangpu Bridge, the Nanpu Bridge has two H-shaped towers and a semi-fan arrangement of cables. Shanghai's Bridges: Nanpu Bridge by Mark Yashinsky is licensed under a Creative Commons Attribution-NonCommercial-ShareAlike 3.0 United States License.